Pierre Teilhard de Chardin and the "Omega Point"
absolutely enthralled with the possibilities for humankind, which he saw as heading for an exciting convergence of systems, an "Omega point" where the coalescence of consciousness will lead us to a new state of peace and planetary unity. He saw this unity as being based intrinsically upon the spirit of the Earth; He suggested that the Earth in its evolutionary unfolding, was growing a new organ of consciousness, called the noosphere. The noosphere is analogous on a planetary level to the evolution of the cerebral cortex in humans. 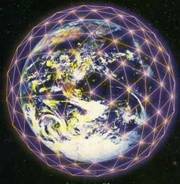 The noosphere is a "planetary thinking network" -- an interlinked system of consciousness and information, a global net of self-awareness, instantaneous feedback, and planetary communication. At the time of his writing, computers of any merit were the size of a city block, and the Internet was, if anything, an element of speculative science fiction. Yet this evolution is indeed coming to pass, and with a rapidity, that in Gaia time, is but a mere passage of seconds. In these precious moments, the planet is developing her cerebral cortex, and emerging into self-conscious awakening. We are indeed approaching the Omega point that Teilhard de Chardin was so excited about. This convergence however, though it was predicted to occur through a global information network, was not a convergence of merely minds or bodies -- but of heart, a point that he made most fervently. "It is not our heads or our bodies which we must bring together, but our hearts. . . Humanity. . . is building its composite brain beneath our eyes. May it not be that tomorrow, through the logical and biological deepening of the movement drawing it together, it will find its heart, without which the ultimate wholeness of its power of unification can never be achieved?"